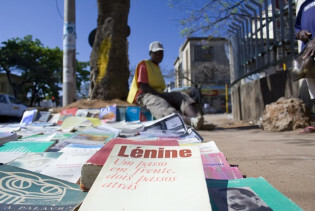 In downtown Maputo, the walls are covered with the local newspaper, Verdade, and a range of people, young and old, male and female, are reading it. Verdade, which means Truth in Portuguese, is a free weekly newspaper that is pasted on the walls of buildings in Mozambique’s capital. In Kilwa District in southern Tanzania local community leader and fisherman Salim Riziki stands next to a set of turbines, newly imported from Dubai, talking about the gas finds on Songo Songo, an island 15 km off the mainland. Lined up along the streets of central Maputo, Mozambique’s capital city, are expensive, European-style bars and restaurants with sophisticated names like Café Continental, Nautilus, 1908 and Mundos. Mozambique is proud home to not one, but two female rappers who are both qualified lawyers. Yveth “Vauvita” Matunza is striking. She is tall, wearing shoes with enormous stilettos. She has on full make up and a smart, tailored dress suit. She is doing her masters part time while working full time at the Mozambican Human Rights League offices - and rapping on her off time.